It's been a great 16 days of Olympics! All my other television shows have gone to the back burner while my eyes have been glued to the Olympics every night and sometimes even during the day. I'm going to miss it! I'm going to recap some of my favorite moments (I probably won't capture them all) of London 2012! 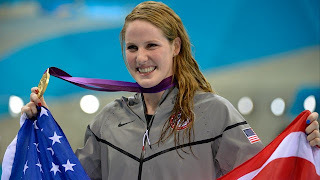 Missy Franklin and her first gold medal!!! I just love her and all she stands for! I love that she is swimming for her high school team and is not accepting any endorsements. She has plenty of time for that! Amazing! Her total medal count was 4 gold and 1 bronze! 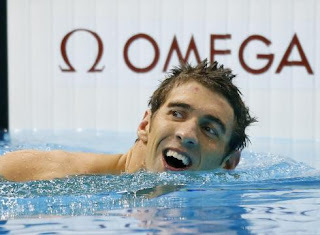 Michael Phelps! Should I say more? I am so impressed that he is the most decorated Olympian of all time with 22 medals!!! Amazing!!! He says London is his last Olympics...but I really hope he shows up in Rio in 2016! 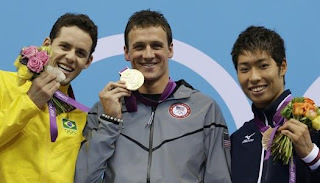 Ryan Lochte and his amazing win over Michael Phelps in the first race in London! It was amazing to me that Phelps didn't even medal...he came in 4th! The Fab Five! I LOVE Gymnastics and when these girls saw they had won gold I cried right along with them! So awesome since USA hasn't had the gold since 1996! Aly Raisman and her gold medal for the Gymnastics floor competition! She ROCKED that routine! Her gold medal was the first for a US woman in this competition! Awesome! Lashinda Demus and her silver medal win in the 400 m hurdles! 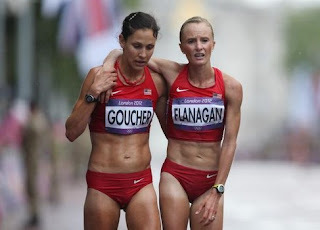 I LOVED hearing her story of coming back to compete after having her twin boys. 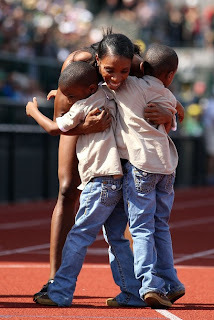 And I teared up when they showed this picture of her hugging her twins after winning the 400 m hurdles final at the trials! 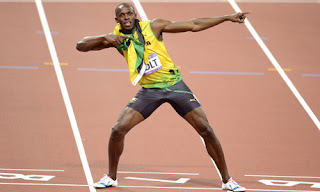 Usain Bolt and his famous pose! I know a lot of you think he is pretty arrogant but I loved his energy! Just like I love seeing the players celebrate in college football I loved seeing Bolt celebrate his victory! Kara Goucher and Shalane Flanagan at the finish line of the Olympic marathon! Kara finished 11th and Shalane finished 10th...and both were not having great runs. But they did it!!! And I LOVE their support of one another!!! Team USA Women's 4x100 meter relay! 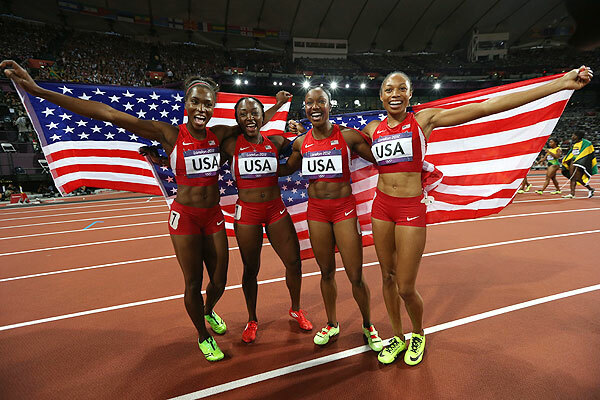 They broke the world record and secured gold for the USA...the first time since 1996! I LOVE their huge smiles in this photo!!! Allyson Felix and her gold in the 200 meters! I just love her!!!! 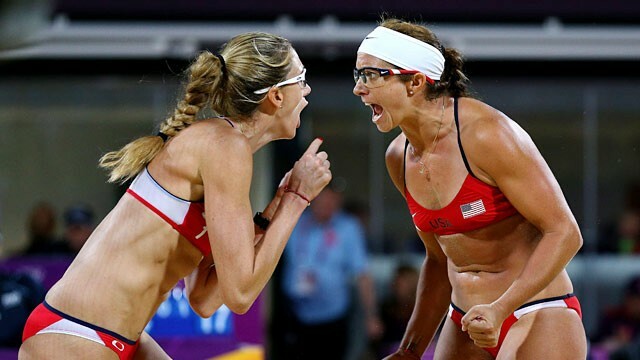 Kerri Walsh Jennings and Misty May-Treanor and their THIRD time winning the Olympic gold in beach volleyball!!! I love them and am really sad Misty is retiring. I know I could probably come up with many more of my favorite moments! I'm so sad the Olympics are over! 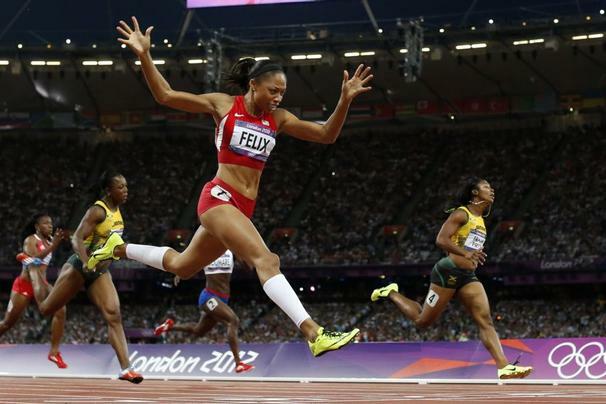 QOTD: What was one of YOUR favorite Olympic moments?